Carefully monitoring the natural gas flow of plant HVAC system boilers minimises fuel consumption, lowers plant energy costs and reduces pollutant emissions. The natural gas flow measurement solution provided by the ST98 Flow Meter allows facility engineers to monitor and control the precise amount of fuel needed to run HVAC boilers efficiently. 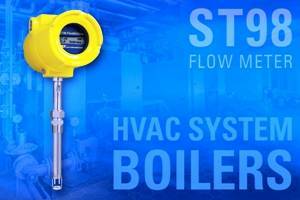 The ST98 Flow Meter’s thermal mass flow sensor design provides direct mass flow measurement without the need for additional temperature or pressure sensors or density calculating devices, as well as the plant real estate and technician time needed to install these extra devices at their additional cost. Its insertion style configuration makes the ST98 meter simple to install in existing piping without cutting the pipe or welding, offering minimal interruption to plant operations. The flexible and dependable ST98 flow meter is suitable for service in plant natural gas and numerous other process gases, hydrocarbon mixed or dirty gases, biogases including methane, and plant compressed air and HVAC systems. The ST98 is today operating in plants worldwide, including industries such as electronics, oil/gas, chemical, power generation, food/beverage, pharmaceutical, pulp/paper, steel, wastewater treatment and more. The rugged ST98’s thermal mass flow sensing element is constructed with two all-welded 316L stainless steel thermowells, protecting two matched platinum precision resistance temperature detectors (RTDs). One RTD is heated relative to the reference RTD, and the temperature difference between the two is proportional to the process gas mass flow rate. The ST98 meter’s transmitter converts the differential temperature signal to a standard 4-20 mA output signal. The meter’s transmitter with its RS232C communications port is housed in either a NEMA Type 4, Type 4X (IP66) enclosure or an explosion-proof enclosure and can be integrally mounted to the flow element or remotely mounted up to 500 feet away. In addition, an LCD display screen indicating flow rate, temperature and totalized flow is available as an option. With no moving piece construction, the ST98 Flow Meter is unaffected by plant vibration and there’s nothing to foul or break. With its highly stable flow sensor, there is virtually no maintenance or re-calibration required, making it a lowest total cost flow measurement solution over its long service life. The highly safe and reliable ST98 Flow Meter features a broad range of agency approvals: FM, ATEX, IEC, CSA, CRN, GOST/RTN, NEPSI, CPA, PED, CE Mark (system approvals). It also complies with the Canadian Electrical code’s requirements for ANSI / ISA 12.27.01-2011 as a single seal device.